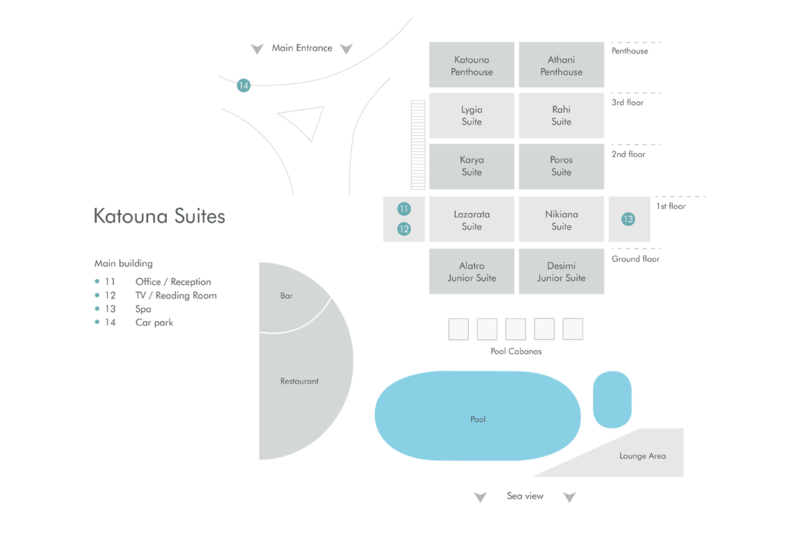 Katouna Suites are currently under construction and our images are digitals, for illustration only. We are pleased to offer an introductory discount of 10% on our published prices on all bookings made until photographs are available. Three things really set Lefkada apart. The unbelievable blue of its waters, the majestic beauty of its forested mountains and the authenticity and charm of its towns and villages. And we couldn’t be more delighted to have found a spot that celebrates all three. Our first Simpson Hotel on Lefkada is an ultra-stylish, adult-only retreat, standing proudly in the hills above the east coast, with spectacular views across the sea to the Greek mainland and situated just a 10-minute stroll from one of the prettiest little villages on the island. The ten contemporary Katouna Suites have been designed with real flair and imagination. Cut cleverly into this dramatic landscape, all our generous and sophisticated suites have a terrace or balcony overlooking the dazzling waters, and are beautifully appointed, with sumptuous beds and luxury fittings. And if you are looking for something above and beyond, the two magnificent penthouse suites offer unbeatable panoramic views and are extremely spacious, both inside and out. The pleasant reception leads to a cool seating area and library; for browsing or selecting that perfect holiday read, and our Simpson Concierge is on hand to help you book boat trips, make dinner reservations or point you towards one of the islands many idyllic beaches. And if you are in need of a little pampering, the hotel also has a treatment room with massage available on request. Outside, clever landscaping creates different levels in the gardens and there are steps down to the simply glorious 23-metre infinity pool and surrounding terrace. Lying here and admiring the view from one of the elegant cabanas is simply heavenly. The poolside bar and dining area has an easy, laid-back vibe, serving drinks and snacks throughout the day and into the evening, striking the perfect note for relaxation. Katouna itself is a very special village. Just a 10-minute stroll from the hotel, it has a delightful church, small central square and two family-run tavernas serving local specialities. It is easy to fall in love with this tranquil spot, immersing yourself in the slow pace of life that the locals enjoy year-round but if you are looking for something more, Katouna Suites are superbly situated. Lefkada town is just a 15-minute drive away and is a vibrant and enticing place for shopping and dining, with an excellent choice of restaurants; some by the water, others tucked away amongst the lovely cobbled streets in the centre of town. The nearby beach in Lygia, just a 10-minute drive away, is quiet and low-key whilst a little further south in Nikiana, the coastline is more developed and offers a more luxurious choice of beachside bars and restaurants. Pretty Agios Nikitas and the famous beaches of the west coast are also very accessible and a drive up through the mountains to enjoy a Lefkada sunset is an unmissable experience. In Greece, a nominal visitor tax applies, known as the Overnight Stay Tax, which varies depending on the accommodation. During your stay at Katouna Suites, €0.50 per night per suite must be paid locally in cash and will be collected either by the hotel owner or our local representative on their behalf.